An assessment of Rainbow Trout distribution and habitat condition was conducted for the Feather River watershed upstream of Lake Oroville. Physical and biological attributes were used to rate the relative condition of 121 sub-watersheds and 64 reaches. Ultimately, the assessment was driven by projections of future conditions for native trout, based on climate change models used to estimate thermal and hydrologic factors. This analysis produced ratings of exposure applied to each subwatershed. Estimates of exposure and condition were combined to produce priorities for restoration based on relative resilience of subwatersheds and associated stream reaches. Trout habitat was rated based on stream temperature, habitat connectivity, biological indicators and watershed condition. Biological indicators included distribution of rainbow, brook and Brown Trout; presence of two pathogens with a history of debilitating impacts on trout in the basin; and presence of three invasive gastropods. Watershed condition was rated using indicators of road impacts (near stream road density and frequency of road crossing), wildfire, number of water diversions, estimates of baseflow diversion and low gradient channel condition. Review of survey records, monitoring, published reports and literature were used to determine distribution of Rainbow Trout (Oncorhynchus mykiss), Brown Trout (Salmo trutta) and Eastern Brook Trout Salvelinus fontinalis. Use of survey records for these species was supplemented by sampling for environmental DNA from 68 stream and river sites. In addition to fish, eDNA was used to detect presence of New Zealand Mudsnails (Potamopyrgus antipodarum), Zebra Mussels (Dreissena polymorpha) and Quagga Mussels (Dreissena bugensis). These invasive species have been found in waters relatively close to the basin. eDNA analyses for the pathogens Myxobolus cerebralis and Ceratanova shasta was also performed. Results found no positive tests for invasive snails. Positive eDNA results for whirling disease and Ceratanova shasta were found at sites where previous studies confirmed presence of the pathogens. Results for trout species showed strong correlations between eDNA results and presence based on survey and monitoring records. Examination of historic climatological data found trends of warmer temperatures, less snow and lower streamflow in the basin. The impact of continued warming on future habitat conditions was assessed using the Basin Characterization Model. Projections from two climate scenarios were used to estimate future air temperatures, runoff and snowpack across the basin. The NorWeST stream temperature model was used to estimate historic and future stream temperatures. Ranges for thermally suitable and optimum conditions for the three trout species were developed and compared. A combined rating of likely future conditions for trout was conducted using projected runoff (representing available habitat), snowpack (maintaining baseflows), and stream temperature. This assessment was used to place sub- watersheds into four exposure classes (Figure i). Indicator information was aggregated to provide relative ratings of condition for each sub-watershed. Condition indicators used in the rating were the densities of stream channel road crossings and roads within 30m of a channel, the number of diversions and amount of streamflow diverted, the condition of low gradient stream channels and the connectivity of stream habitats (presence or lack of barriers to fish movement). Available stream monitoring data was used to explore the relationship between the condition factors and habitat conditions and provided justification for their use. Results revealed a range of conditions within sub-watersheds. The few watersheds with no or very few roads and no stream diversions were rated in the best condition. Typically, watersheds in the higher elevations (usually with steeper terrain) had less roads and fewer diversions. Presence of whirling disease, and presence of high severity wildfire (in past 15 years) were deemed to be important condition indicators. They occurred in relatively few locations, so were not included in the basin-wide rating. Rather they are noted where present in watersheds ultimately rated as priority for restoration. Rainbow Trout were found in every sub-watershed and reach, and brook and Brown Trout in most areas. Only 4 sub-watersheds are thought to support only Rainbow Trout. Stream reaches were generally found to be in poor condition. Reaches in the headwaters are strongly influenced by roads and had highest densities of channel crossings and near stream roads. Mid-elevation reaches located primarily in the large meadows of the basin are the site of considerable diversion of baseflow for agricultural use and displayed warm stream temperatures. Farther downstream, water temperatures in reaches were typically too high to provide highest quality habitat for Rainbow Trout. employed. Both approaches emphasize protection of areas in the best condition, and reconnection and restoration actions targeted at priority habitats. Geographic restoration priorities were based on the relative resilience of sub-watersheds. Resilience was assessed by combining ratings of exposure and condition. Highest priority for protection and improvement was given to areas that possess the lowest exposure (best streamflow, snowmelt and thermal) characteristics; and the least disturbance (best connectivity, fewest diversions, fewest roads). 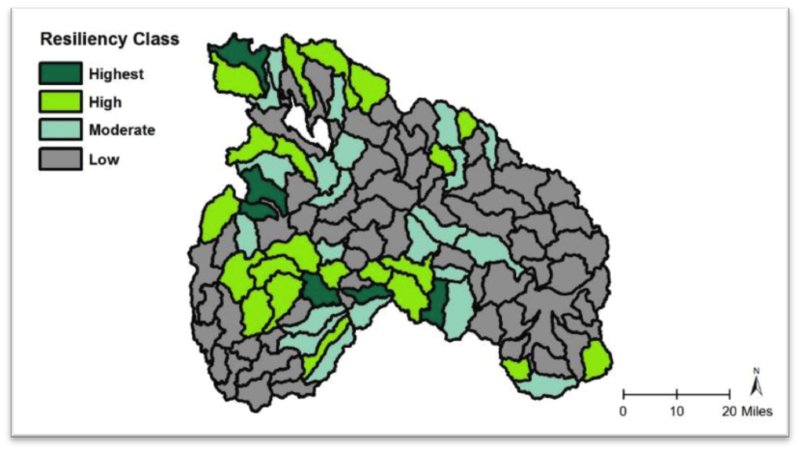 In all, 48 sub-watersheds were classed as priority, with 5 receiving a rating of very high resilience, 21 with high resilience and 23 with moderate resilience (Figure ii). These areas were typically sub-watersheds at high elevation where projected changes to snowpack and stream temperature would be moderated. As a result, sub-watersheds with highest resilience tended to be clustered. Reaches that provide connection between sub-watersheds within the resulting clusters, and between clusters, were rated as highest priority for protection and restoration. Actions that could be applied to maintain or improve resilience of priority areas are recommended and discussed. Results from eDNA surveys for whirling disease confirmed the presence of the pathogen at several locations in the basin. This disease has had devastating impacts on fish populations in the basin, and elsewhere in the western United States. Currently, there are no efforts or actions by any agency or party to contain or manage whirling disease in the Feather River. Development of a plan or strategy for containment of the disease is identified as a top priority for restoration in the basin. The condition ratings provide a starting point for identifying other actions most likely to maintain or improve resilience in the priority areas. Subwatersheds in the highest priority class are targets for protection as investments in restoration actions are not needed to maintain their resilience. Subwatersheds with low road condition ratings could be improved with treatments aimed at disconnecting road-channel delivery of fine sediment and runoff; work with water users on fish screens and instream flows are of high priority in areas with diversions. Improving connectivity by providing for fish passage at key man-caused barriers (typically road crossings with culverts) is priority in areas with low connectivity and appears to be the most practical way to improve resilience in the short term. Figure ii. Priority subwatersheds for restoration, by resiliency (priority) class.